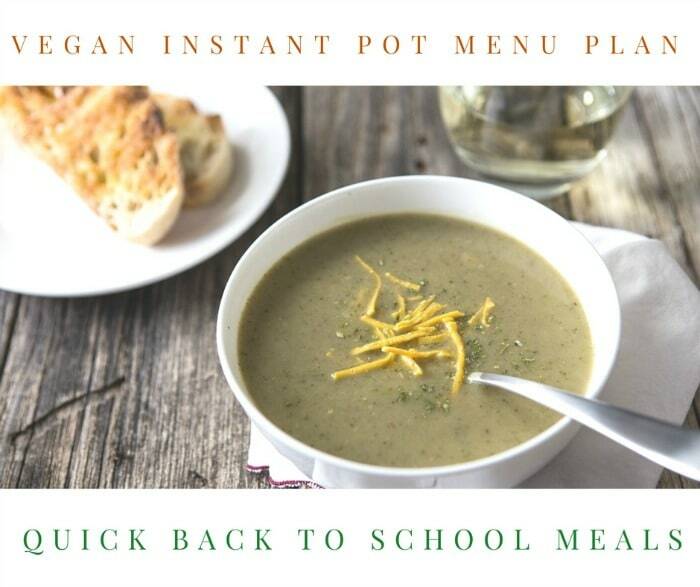 Home » Instant Pot » Instant Pot Vegan Menu Plan: Quick Back to School Meals that Wow! Even if you aren’t going off to school or don’t have kids, back to school time is great to start some new habits. It always feels a little bit like New Years, in that you get a clean start. It can be a busy time if you do have kids or classes, but this week’s menu plan should have you in and out of the kitchen in a flash! 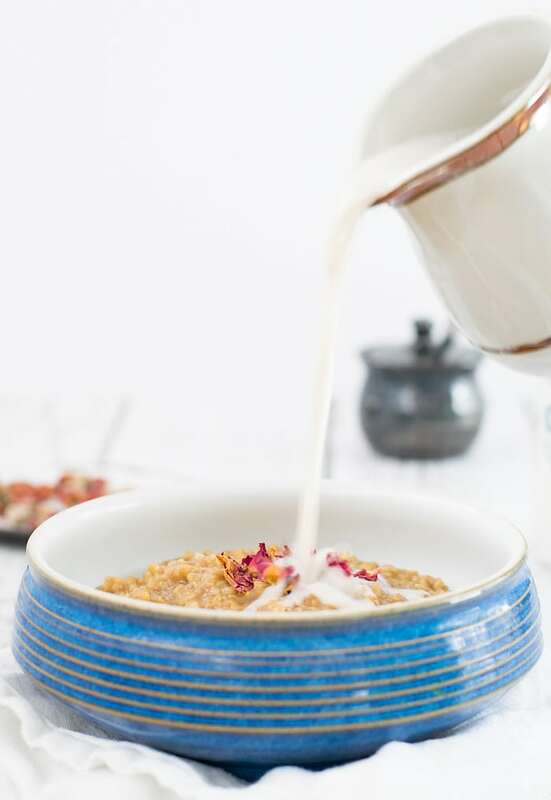 I’ve also switched it up and gave you a recipe for Instant Pot Earl Grey Oatmeal w/ Rosewater that you can eat all week. But if you want a dessert this week you could make Jill Nusinow’s Cashew Lemon Cheezecake or Vegan Pear and Cranberry Instant Pot Cake. Breakfast: You can make this Earl Grey Oatmeal w/ Rosewater Sunday night and eat it for breakfast all week long. Don’t like Rosewater? Try my apple spice oat recipe instead. Make some cold brew coffee and you’ll have it to take with you everyday. Plus think of all the money you’ll save not stopping at a coffee shop every morning! 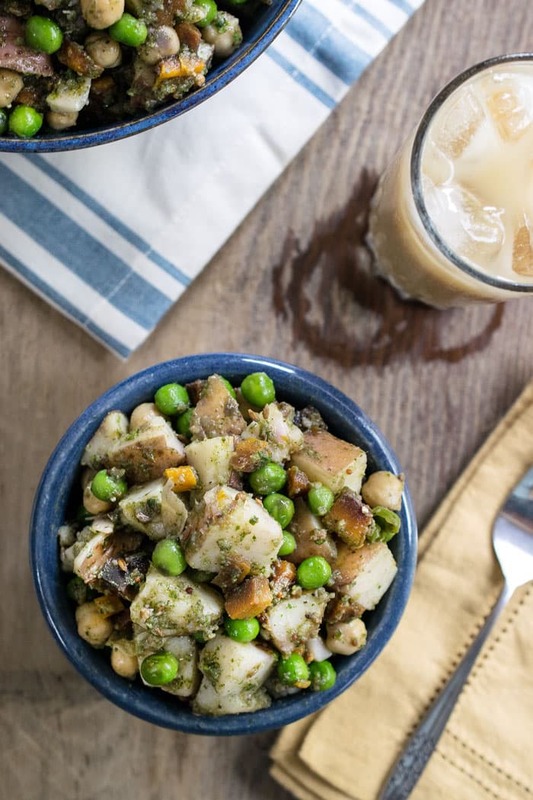 Monday: Start your week off with this Easy Indian Potato Salad Recipe with Idaho Potatoes, and toss in a drained can of chickpeas to make it a complete meal. You can make it the night before and serve cold or eat it hot. Either way, you’ll have lunch leftovers for tomorrow! 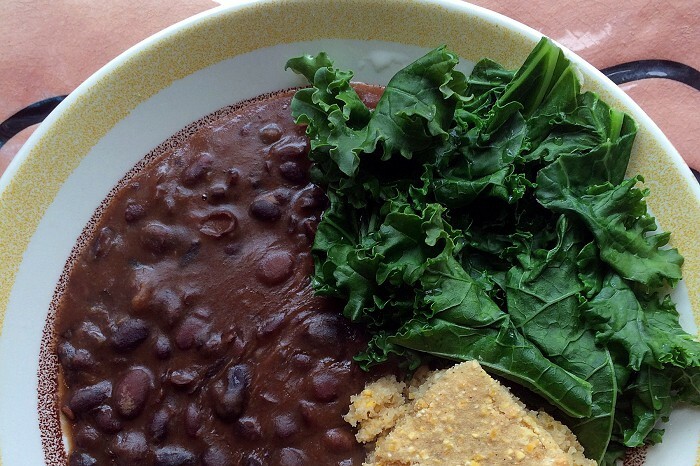 Tuesday: Make a green salad to eat with a big bowl of this Miso Hemp Split Pea Soup. You can even add in a hunk of bread to top it off. Not into split peas? Try my creamy tomato soup instead. If you feel up to it go ahead and make a double batch of potato tamales, cook them in the Instant Pot and store extra in the freezer. Thursday: Make a batch of Kittee’s Creamy-Dreamy Saucy Beans and serve over cooked brown rice, quinoa, or your favorite cornbread. 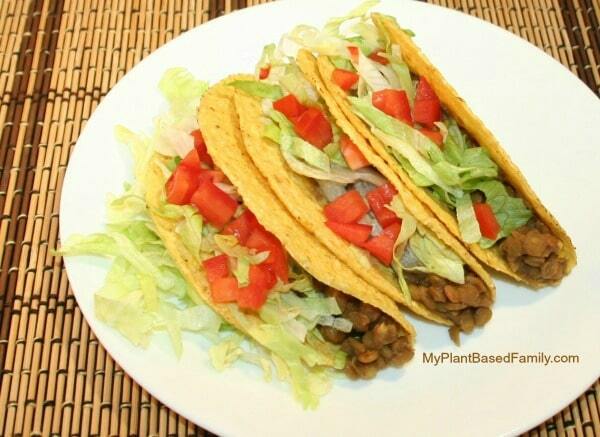 Wrap the leftovers up in burrito shells to make lunch or to stash in the freezer for a day you don’t feel like cooking. You could make Cranberry Bean, Millet and Bulgur Chili or White Bean Soy Curl Chili (with Options). 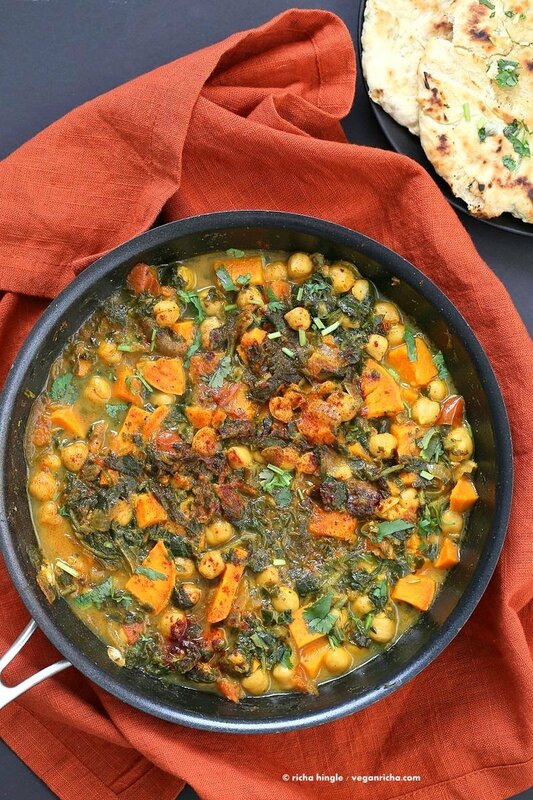 Friday: Chickpea Sweet Potato Spinach Stew is the perfect way to start your weekend. Serve with steamed brown basmati rice or vegan naan. 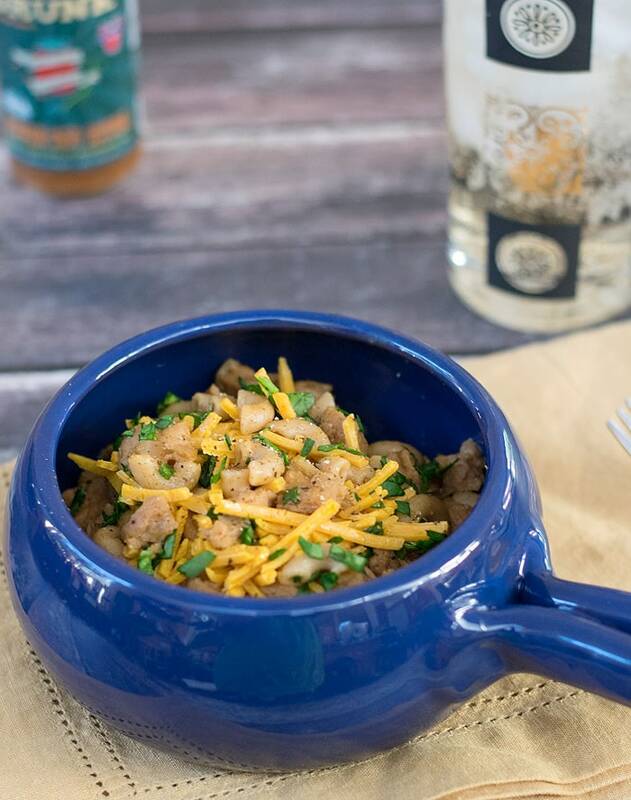 Try the leftovers in your weekend tofu scramble. Sunday: Get ready for the week ahead and you’ll still have plenty of time to make this quick Hearty Broccoli Soup. Try making some tofu croutons to use as a topping. 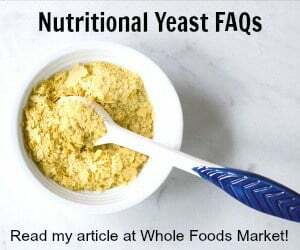 Great post which I will use. Thank you!!! I LOVE my Instant Pot – so thank you for more reasons to use it! 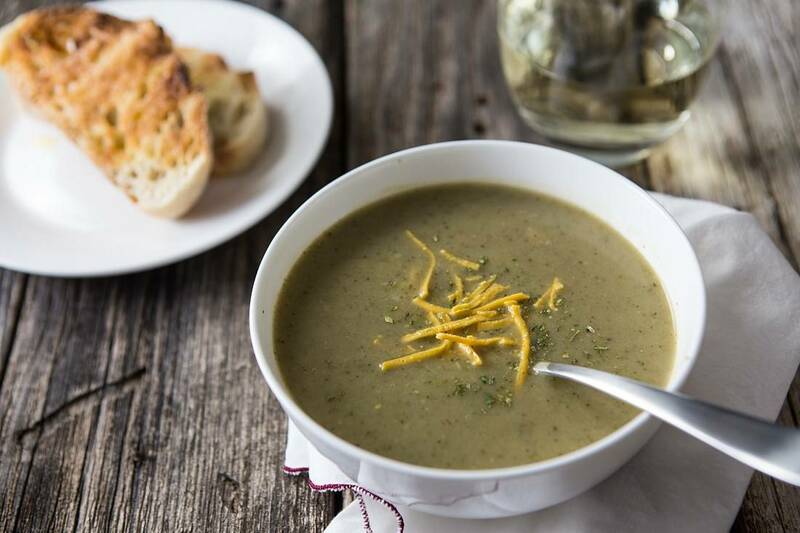 Thanks for including my Hearty Broccoli Soup in your round-up! This menu looks and sounds absolutely delicious! 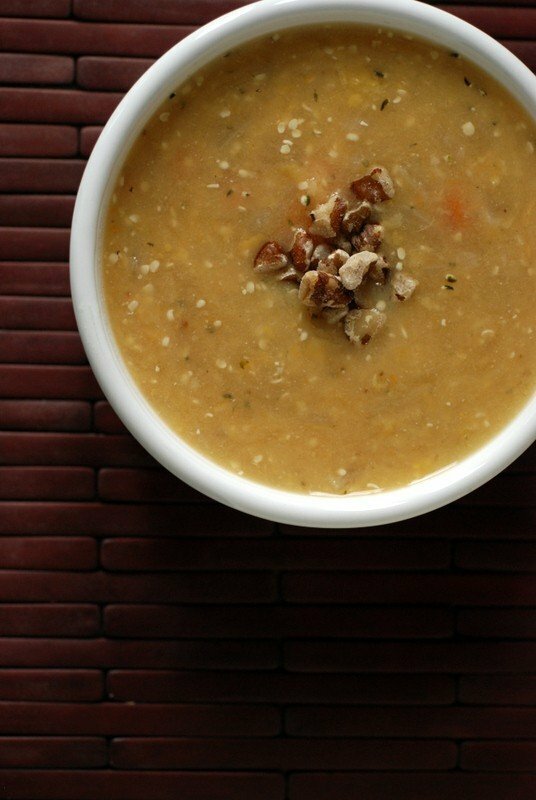 Oatmeal and soups (especially split pea soup) are definitely meals I can happily eat every morning. Thanks for the links and ideas!